• Structure ID: NBI 000000000038201. • Location: River Mile 455.90. • River Elevation: 536 Feet. • Daily Traffic Count: 4,130 (2002). • Length: 3,018 Feet Overall. • Width: 32 Feet, 2 Lanes. • Navigation Channel Width: 500 Feet. • Height Above Water: 65 Feet. • Date Built: Opened December 2, 1972. 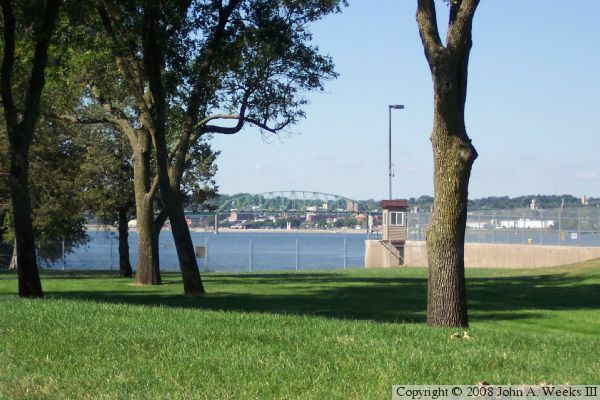 The Beckey Bridge is the first bridge south of the busy Quad Cities area. 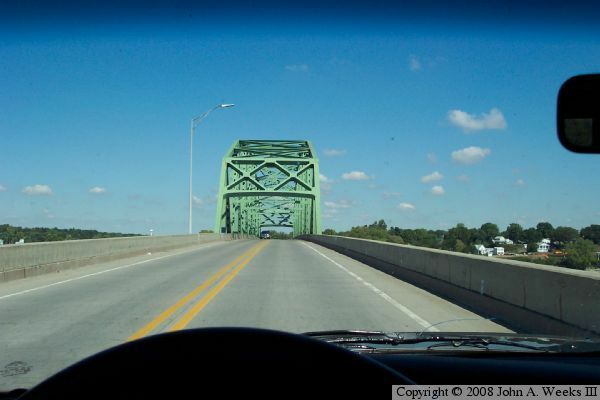 This bridge is far less busy than those just upstream in the Quad Cities area. City officials are not sure how Muscatine ended up with that name, but they are sure that Muscatine, Iowa, is the only Muscatine in the world. The city was world famous 100 years ago as the center of the button pearl industry. Clams that lived in the river were perfect for making buttons, and were far less costly than those made from ivory. In one year, Muscatine produced over 1.5-billion buttons, nearly 40% of the world output. Today, most buttons are made from plastic. The city is also famous for the sweet-tasting watermelons and muskmelons, and is becoming famous as a great place to watch Eagles in the winter. There was an earlier bridge over the river at Muscatine. That bridge is interesting in that it collapsed on two different occasions. Built in 1891 as a private venture, the bridge cost $150,000 to build. It first collapsed in 1899. A crew of men and a team of horses pulling a load of logs heading from Illinois to Iowa fell with the bridge down 40 feet into water. The second collapse was on the early morning of June 1, 1956. A police officer was chasing a speeding car through town. 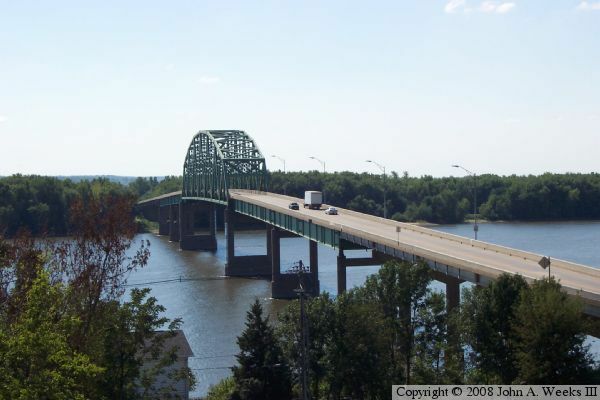 The car entered the bridge, lost control, broke through the wooden guard rail, and smashed into one of the structural members of the bridge truss. When the car was removed by a tow truck, the truss section failed. There were several vehicles on the bridge, but none ended up in the river, and there was only one slight injury. The bridge took about 135 days to fix. 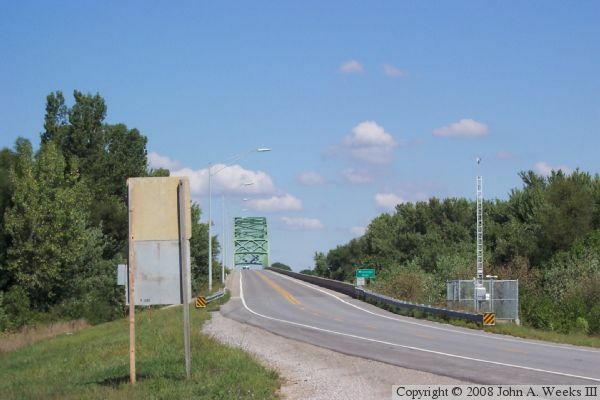 It remained in service until the Norbert F. Beckey Bridge was opened for traffic.